At first I thought the flexible black plumbing pipes must have been a temporary feature, but they’ve been there for weeks – almost months – now, and so I can only presume that they are intended as a type of free-form sculpture to liven up the lives of the poor miscreants inside. We’ve copped flack from a gentle soul at ArcHaus before over our critiquing of a building before it was complete, so I thought I’d given this one a good chance before unloading on it: but really, the quality of this building is far below what should be allowed in our city. While I know that we’re living far away from scrutiny (globally speaking), and don’t have the budget or standards of a major world city, we do have an RMA process that is meant to stop the worst of developer-driven dross, and an aesthetically-aware Council that is expected to raise the bar. Not drop it and run. It is of course a development from Merge – the first of their developments, and judging by their progress on other sites in town possibly their last. Just over a year ago they knocked down the old Forest and Bird headquarters in nearby Taranaki St, and the site is still bare and uncared for today. The Forest and Bird building had a polite and well-mannered Art Deco facade, with a great wildlife mural over the entire front: now all we’re left with is a muddy hole with rickety fencing that seems to fall down at least once a week. Mind you, that may be an improvement over the tedious banality of what is proposed: Te Aro Towers.�All we can hope for is that the lengthy delays may afford time for a complete redesign. Merge are a curious crew – fervent disciples of the dodgy�property-spruikers�RichMastery, at one stage their website claimed that Fran Wilde was on the board, but she appears to have broken free from their ranks, and is now firmly in place at the Great Wellington Regional Council. Lucky escape Fran. If that was indeed their real reason then it was a sad inditement of the respect and trust afforded in the RMA – we’ve said it here before and we’ll say it again: public notification is not a bad thing, and if the quality is there in the design, then it is a good process to go through. Of course, the real reason is more likely to be the collapse of the small town property market – but then again, if the design is awful in the first place then it deserves to die at the hands of the public drubbing it may face. In the end, it comes down to whether a developer is interested in anything other than their bank balance. Does a ‘property developer’ have any duty to the city, to provide an architectural fabric that we can all be proud of, or does it only exist in order for them to line their pockets? Certainly with the Duel on Vivian the answer seems obvious enough – a cruelly mocking retort to the School of Architecture on the other side of the road. BoatHaus! BoatHaus? English|German; House|Haus; Boat|Boot. Couldn’t Merge just pick one language and stick to it for at least the length of a single word? Appropriately, for builders of shoebox apartments, the dual to BoatHaus would be BootHouse. I wonder if the Dual on Vivian street could be up for a rename. Merge don’t own Duel on Vivian. The building your bashing is not finished and just the fact that you don’t know who owns it but your willing to go public with your dislike shows your extreme lack of journalistic integrity. Or am I missing some information here? I’m the first to admit that I’m no expert on the Wellington property development scene. Spleeen, it is just another ugly low quality building in my opinion, but if you know something redeeming about it, share. 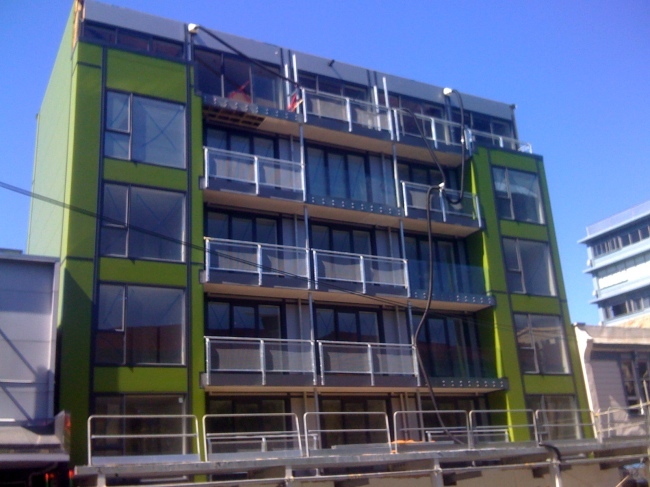 I quite like the green – agree that if the plumbing stays as is then it’s pretty ridiculous. However what amazes me about this building is that there are almost no windows facing east and west! Full balconies and sliding doors facing north – including onto the delights of the Tournament carpark behind. Seriously, who’d want their living room facing that? Having watched this building grow on a daily basis as I drive in and out of that carpark, it’s pretty shoddy. I suspect with Te Aro Towers, it was targeted strictly at investors, and that portion of the market has collapsed. Mergenz’s Metropol project, on the other hand, is marketed to owner-occupiers, and on the surface of it is higher quality. Again the acid test of an apartment development is how fit would it be for its developer to live in it. Mergenz do say on their website about the Te Aro Towers (http://www.mergenz.com/developmentprojects/show/te-aro-towers) that all 108 units have been sold. I guess that isn’t the same thing as having (access to) all the money for 108 units worth of building though. In the meantime, the vehicle ramp for the building next to one of the proposed towers gives an interesting effect. Almost looks like it could be from a street out of Blade Runner. Frontlawn, yes Merge are selling it but they are not the developer. Erentz, I disagree it’s not ugly in my opinion it’s “Bland” possibly a waste of site potential but not ugly. Brin, not having East West windows is to allow for future development of neighbouring sites so that promised light planes are not blocked out in future just common sence. DeepRed, I’m sorry but I think your acid test theory is at best just plain wrong. That’s curious. Some time in the last couple of hours the Duel-on-Vivian page has vanished from the Mergenz website. The link above which is supposed to point to it just shows you the other “investment opportunities”. The nice folks at Google still have the page cached though so one can do a search for merge duel vivian and click on the “cached” link — perhaps only until things get updated on the google servers. The original advertising page for the Duel apartments is still up (for the moment) too: http://www.duelonvivian.co.nz/ Maybe not for long though if other pages are being taken down. Journalistic integrity? Of course not – this is a blog. And we’ve waited ages for it to finish – someone must be getting a whipping for non-completion. This blog is just a place for public commentary, seeing as the ‘broadsheet’ press are too lazy or dis-interested to comment on buildings and construction. Come on Spleen – you know its awful. Just because you go to the same Rich Mastery class doesn’t mean you can’t launch into them as well. They’ve got to do better than this. Oh sorry my mistake it’s a blog so you can say any old cobblers and pretend it’s true. Must be nice in your world don’t have to check facts just go with your gut feel. Ah and now your telling me that I think its awful, well no I don’t I’m really not a fan of it, it’s bland and boring but then it’s also not a public art work. But then I didn’t buy one and wasn’t involved in the design or marketing and have the ability to quite easily ignore it. But back to you so your saying that because you have a nice looking site and a readership in blog format you don’t have to tell the truth? Are you not even a little bit red faced for getting this so wrong? Spleeen: Maybe I’m being a bit slow, but I haven’t picked up what the particular errors are that you are objecting to here. Would you be able to tell us what the specific errors are and maybe present the necessary information to correct them? I can’t speak for Maximus, but from the only information I’ve seen; Merge listing (until this afternoon) the Duel, (who are they suggesting is dueling anyway? ), as a “Development Project” on their website, Merge would be the first ones I’d call “the developers”. Whatever “developer” means and depending on how you split your hairs. I think the main point of the post was that Merge have a hand in this building, it’s not that good looking, it’s been this way for quite a while and the same firm are involved in a few other developments. I found that worthwhile reading. Is the fish leading me up the garden path? spleeen: The beauty of blogs is that they allow their readers to join in with the conversation on the topic being discussed. If some points need to be elaborated upon or explained in further detail, that’s what community members (i.e. you and me) can do. This isn’t a news report or an academic paper; it’s more akin to a conversation. Hmmm. That makes me think. Did I strike a nerve? No comments here from Merge (nor ArcHaus, Silvester Clark, or Hawkins yet). Perhaps then, you’re getting a bit sensitive over this because… am i getting warmer if I was to say that you are the developer? Obviously not. Fish don’t have red faces. But my mouth is agape with shock and mock outrage at being accused of not telling the truth. Mobsta – can you use your CityScope connection to find out who owns the site? Wellington needs more of this SIZE ‘infill’ apartment buildings and less of the 15 storey behemoths IMHO, especially in the dodgier lowrise side of Te Aro. While not a stunning architectural wonder, if well constructed and pleasant to live in, then it won’t detract from the streetscape. It’s reasonalby tasteful and is not out of scale with its surroundings. Hopefully they will start building something on that old Forest and Bird site, it seems it might be the next Swan Lane at this rate. Not to mention the Watermark site. Maximus, No I’m not with Archaus, or Merge or Hawkins and no I’m not the developer. And yes you did get it wrong you are saying that Merge are the developers and they are not, I just feel you need to check your facts a little better. Also it always amazes me that people will blog because it’s free to everyone to express their opinion, but as soon as anyone does they are attacked and hunted down as though if you knew who I was it would validate or invalidate my opinions? Ahh so now your going to do your homework? Let me help you out a little after you get through the red tape, structures and entities the developer is Ash Pama. The development was originally marketed by Richmastery then it was with Rene Morbey for a while and now Merge Property are marketing some of the final units. Thanks for that. That’s the great thing about blogs – everyone is keen to help each other. 60mPa (does that mean you’re a hard man, or is it an expression of density?) i think i always suspected that it was not the final solution for the building – but hey, you know, there’s always room for a last minute variation…..
electric – you’re completely right about the size of this building – its good to see some buildings in the 5-6 storey range, as opposed to the 9-16 range that are being proposed elsewhere. Its just the quality levels that need to be higher, not the rooftops. Of course, this one was planned to be higher at first, but I believe it may have been knocked back a little to protect the sunlight angles into Cobblestone Park at lunchtime. Forest and Bird has been vacant for over a year now – seems long enough for anyone to get a set of working drawings out, especially for something as repetitive as Te Aro Towers. But we’re watching Watermark’s site with interest too. Description: Duel on Vivian development at full height in September 2008. To be a 6-storey building including the ground level. Builders; Hawkins Constructions. Architects; Archaus. 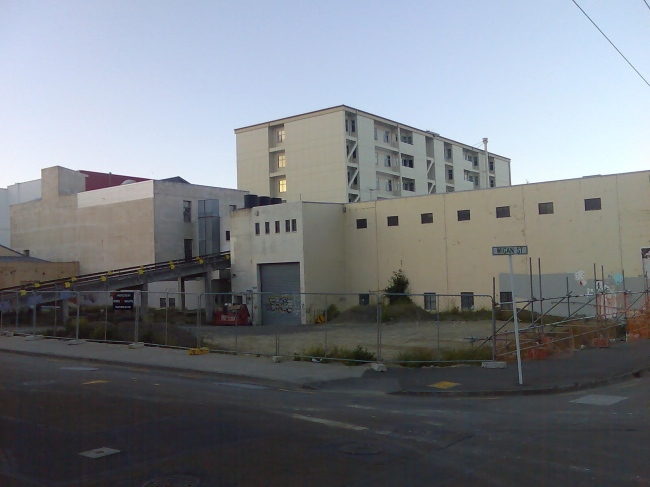 Formerly the site of twin two-storey timber buildings and a single-storey building, built circa 1900 and demolished in 2005. Proposals: 6/08: Subdivision Consent for a unit title was approved in June 2008. Owner: Vivian Street Properties Ltd, 20 Falkirk Ave, Seatoun, Wellington 6003. Vivian Street Properties is directed by Kusum Paragji of Seatoun. It is owned by Pan’s Trustee Ltd. Pan’s Trustee is directed by Michael Chung of Roseneath and owned by Kusum Paragji of Seatoun. Sales History: Properties 21 (except for 96 sqm at the rear) and 24 were bought by Concrete Jungle Ltd and transferred to it in February 1987. Also in February 1987, Renouf Property Developments Ltd arranged to buy them. They were resold to Brougham Investments Ltd in September 1988. The transfers to Renouf and then to Brougham were registered on the same day in June 1989. Properties 21 (still without the 96 sqm at the rear) and 24 were bought by Pito-One Shell No 1 Ltd in August 1989. They were bought by Murray Burns in December 1991. They were auctioned in August 2000, not sold. Murray Burns bought the 96 sqm at the rear in March 2002 and the combined property was auctioned in August 2003; agent Bayleys. It was bought by Equal Investments Ltd for $880,000 in February 2004. It was bought by Vivian Street Properties Ltd in August 2004, also for $880,000; agent Bayleys. Street Frontages: 17.96m to Vivian Street. Title Details: Pt lot 33 DP 582, lots 1-2 DP 5912; CTs 40D/424, 304/244, 304/245. Pt lot 32 DP 582; CT 460/133. This information was brought to you by the kind folk at Cityscope. IMHO, this building is ‘ordinary’. It displays no architectural brilliance, and I doubt that any is going to magically appear when it’s finished. Yet it appears that many readers seem to object to that ordinary-ness. It is not in a prominent location that demands architectural spectacularity. It is not a corner site, at the termination of a vista or defining the edge of a public space of city-wide significance. (Sorry Cobblestone Park, but you’re not that yet!) 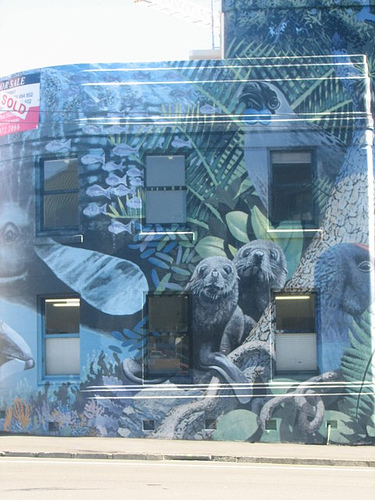 It is outside the Cuba Street Heritage Area. In between the buildings that knock us over with their brilliance, innovation or memorability, surely we need good hard-working buildings that perform their function without competing for prominence? The ‘background’ buildings…??? I’d rather have my attention captured by either the Architecture School over the road or the green hillside of Mt Vic terminating the vista along Vivian Street (eastwards, anyway) than something on this site. I’m not saying this building is good, but can’t we just let it get on with being ordinary? Yes, LAS, you are correct that this building is doing a fine job of being ordinary. However I think there is still a distinction between the poor quality design, and good quality design – and also between poor quality construction, and good quality construction. There is nothing to stop a building being ordinary, but still good in its level of detailing and the ability of the contractors to carry that out. Here however, I tend to agree that something has gone tragically wrong. From the planning of the units, which is on the small side, and unfortunately looking out at either the roof of the brothel, the blank side of the carpark (the better units here would have to be the east side over Marion St) – to the detailing of the Kingspan panels which appears to have been carried out in a, aaah, shall we say, haphazard manner? it certainly appears as though this building has had very little care taken over it. So I for one, while revelling in its ordinariness, really do think that somebody somewhere should be trying a lot harder with this project.